1. To the right, you see two plants displayed. 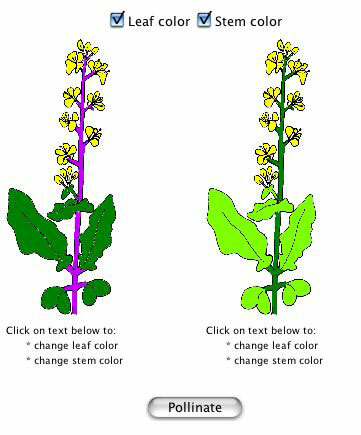 First, choose if you want to look at stem and/or leaf color by checking the appropriate boxes. 2. If you want to cross parents with different traits, click on the text below the plants to change the leaf or stem color. 3. To pollinate the plants, click on the button "pollinate" below the plants. You should see a bee travel between the two plants. 4. You will now see a new screen, similar to the one at the right. On the left, you see the two parents that you crossed, while you see 64 progeny on the right. 5. 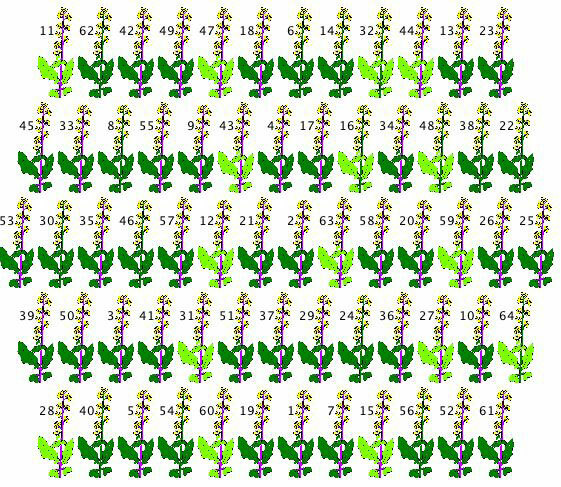 Now, choose any two plants from the 64 progeny. Click the "pollinate" button. A bee will pollinate them. 6. Another new screen will then appear that shows the new 64 progeny, the parents, and the grandparents. 7. You can go back to any screen and repeat a cross. They will be labeled either F2a, F2b, F2c, etc. 8. You can also perform test crosses with parent plants by clicking on a parent and one of the progeny. Now, go try the online computer simulation for yourself! !